It was time again for my wardrobe re-evaluation (you can call it purging) because I realized that my wardrobe has been growing more than expected (mainly shoes). So, I decided to let some things go with the intention to continue keeping my wardrobe small, smart and circulating. While I was going through the re-evaluation process, suddenly a question popped in my head. What would I do if we ever go to war and the money and supplies are limited, like perhaps what happened with many women back in the 1940s? I know my biggest concern will be putting food on our tables, but how long will it take before I start feeling the withdrawal of not being able of purchase anything new to wear? …Probably, not long. If you read about women and fashion around WWII (of if you already had), you'll see that women became more creative with the things they had on-hand; they weren't able to purchase new items as often they used to, so in order to stay fashionable, they had to be creative to the point that they would sneak into their husbands wardrobes and find pieces to mix with their own. 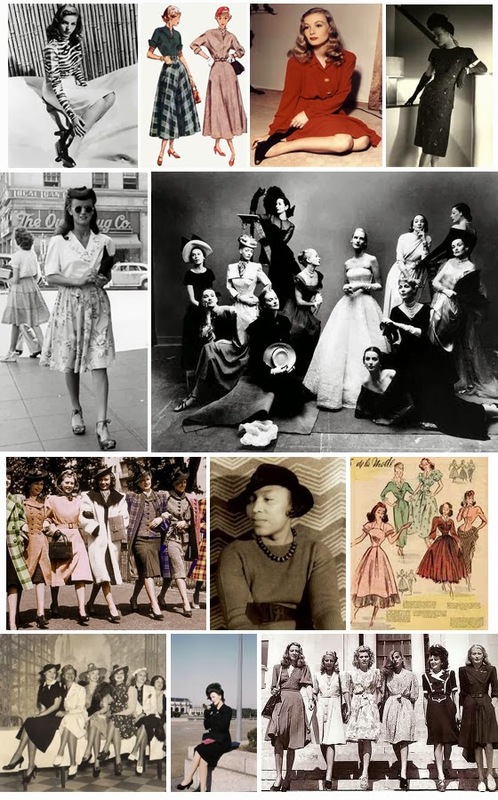 We're obviously not at war at least here in the United States, but I want to keep the 1940s women's fashion concept in my mind and every time I start seeing more items in my wardrobe than days available to wear them, I need to stop and re-evaluate again. By the way, my today's look is inspired by the1940s with, of course, a modern touch. Era tiempo de revaluar mi armario (tu le puedes llamar purgar) porque me di cuenta que estaba creciendo mas de lo que yo había planeado. Así que decidí despedir me de algunos atuendos (principalmente zapatos) con la intención de continuar manteniendo mi armario de un tamaño pequeño, inteligente y en circulación. Mediante mi proceso de revaluación se me vino a la mente una pregunta. Que pasaría si estuviéramos en guerra cuando el dinero y las compras pueden volverse limitadas, como por ejemplo lo que paso en los anos 40s para muchas mujeres? Yo se que mi primera preocupación seria como poner comida en mi mesa, pero cuanto tiempo va pasar antes que comience a sentir la nostalgia de no ponerme algo nuevo? …Posiblemente no mucho tiempo. Si leen acerca de las mujeres y la moda en la Guerra Mundial II, comprenderás que las mujeres en esa era se volvieron creativas con la moda por la falta de dinero o lugares donde poder comprar artículos de moda. Ellas usaban y re-usaban lo que tenían en mano y hasta se iban al armario de sus esposos para tomar prendas prestadas y combinarlas con las de ellas. Obviamente no estamos en guerra ahora al menos aquí en los Estados Unidos, pero quiero mantener el concepto de las mujeres en los 40s en mi mente, y así que cada vez que comience a ver mas prendas en mi armario que los días que tengo disponibles para usarlos, entonces será tiempo de revaluar otra vez. A propósito, mi conjunto de hoy fue inspirado por la moda de los 40s, pero con un aire moderno. I will leave you with this picture that I found on Pinterest of fashionable women in the 1940s. Sunglasses/Gafas: Givenchy (Vintage) I found this awesome vintage style and very similar by Christian Dior. Fun idea for a post. 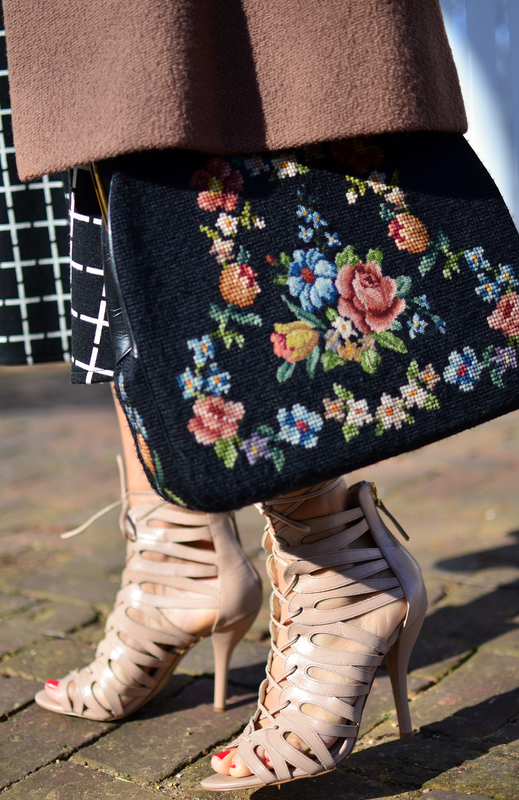 Your outfit is lovely and the shoes and bag speaks to me. My parents were of this generation and I live in a house built in 1940 so I do have a fondness for the style of this time. 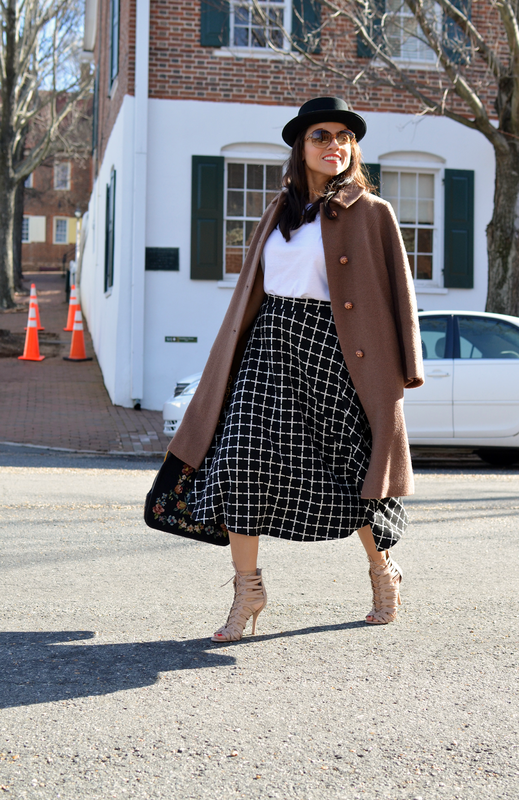 This skirt is beautiful and I'm sure you have many ideas for styling it! How great! I'm sure their house in interesting and beautiful (I love really old houses). Ann, this skirt is extremely versatile and btw, I have another one just like it, but with blue plaid instead. Gran inspiración, aparte de ser mi época histórica favorita me encanta todo lo que envuelve a como aunque estaban en guerra la gente que no estaba ahí seguía teniendo una vida "normal" y la moda seguía siendo parte del día a día y es fantástico ver como se pusieron creativas y surgieron tendencias y estilos nuevos. Vas maravillosa en este look, es muy femenino y bonito! Gracias por las fotos, son un gran vistazo del pasado! This is such an adorable outfit! It is so well put together. I wish that was still the trend. The lady-like style is coming back and I am so happy about it. Thanks so much for visiting and btw, you have a great style and blog. Keep it up. Love the shoes and skirt on you. Great look, especially the hat! Thanks so much Zhan na! A wide-brimmed hat could've been a great alternative as well. 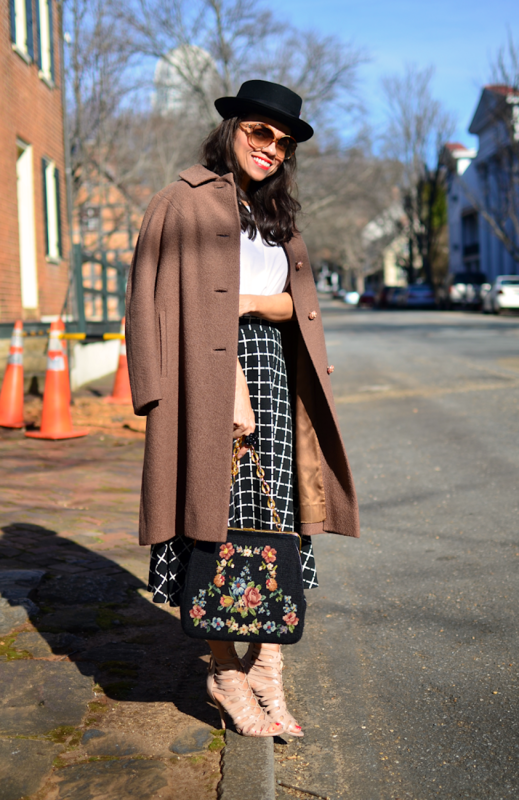 I used the porkpie hat in order to add a touch of "borrowed from husband's closet" in my look. As a matter of fact, women were the first ones wearing the porkpie hat back in the 1830s and worn by men until the 1920s. Femineidad y mucha elegancia, la propuesta es fantástica y como la complementas !!!! Georgeous outfit, love the mix ! I often find myself at a dead end staring at my bulging wardrobe not knowing where to start any outfit whenever I buy to much! OMG! Thanks so much for the link, sometimes I wish to live near to Manhattan and have the chance to go all those great vintage shows. They seem to be amazing. I agree - they always seem to be full of the most amazing treasures! The bag, the shoes, the skirt, the coat. I love everything about that look!! love how you were inspired by the creative thinking of women during that era! La falda es absolutamente perfecta! !